Writers don’t like being told what to do. That’s part of what makes us writers. We like to write about what we want to write about, and if somebody tells us what to write about, a lot of us will struggle. Just like most people, I don’t like being told what to do, but I also don’t like telling others what to do. This puts me in a bad position. If I don’t like being told what to do and I don’t like telling others what to do, then I’m in a social no-man’s land. Maybe that’s why I like being a writer; I have complete control without really having to make decisions for anybody else. I don’t like being told what to read either. As a reader, I constantly see lists about what books I should read, must read, have to read. The best thing about not being in school anymore is that nobody tells me what to read, and if somebody does tell me what to read, I’m usually getting paid for it. Even though I’ve seen plenty of online lists telling readers what to read, I’ve never seen a list of what writers have to write about. If there are certain books we must read, then there must be certain topics that we should have to write about. It just makes sense. But I don’t like telling others what to do, and I feel awkward telling other writers what they have to write about. It goes against my nature. Then again, I’m not the one who decided what authors have to write about. It just is. If you’re going to write, these are topics that you have to write about. These aren’t the only topics you have to cover, but you have to write about these. There’s no way around it. A lot of writing advice sounds pompous. I don’t want to give any examples because I don’t want to offend any advice-givers by calling them pompous, but you probably know what I mean. Nothing sounds more pompous than saying MUST really loudly. If I’m going to give writing advice, I might as well go all out and sound pompous, so you MUST write about these topics if you want to be an author. Maybe the contrarian writer will look at the following list and say, “Screw you, Dysfunctional Literacy! You can’t tell me what to write!” The contrarian writer might go out of his/her way to deliberately avoid writing about the following topics just to prove to it can be done, just to demonstrate that a writer doesn’t have to MUST write about any particular topic. Most stories about one individual are kind of dull. Even stories about one person include relationships of some kind. Robinson Crusoe had Wilson. Or was it Friday? I get them confused. Honestly, I try to avoid emotions as much as I can in my personal life because they can distract me from reading and writing, but writing without emotions can be boring. I like boring in my life, but I don’t like boring in my reading and writing, so I write about emotions whenever I can fit them into my stories. If you can’t write about yourself, who can you write about? Every character you create is an extension of yourself in some way. Or maybe not. But some character in every story is probably an extension of yourself. I have no evidence to back that up, but it sounds good, so it must be true. Of course, you have to write about what you know. It’s probably impossible to write if you don’t know anything about everything that you’re writing about. Then again, I’ve never tried it, but I’ve never heard of anybody who has, so it has to be impossible. If I only wrote about what I knew, my writing would be pretty limited. Luckily, I have the internet. With the internet, I can find out about stuff that I didn’t know about and then pretend I knew it all along. Nobody knows what I know and don’t know, except maybe Google, but I hope Google is too busy selling information in bulk to look individually into what I know and don’t know. I wonder how writers wrote about what they didn’t know about before the internet. I guess they just made stuff up. As much as I enjoy a challenge while writing, I’m not sure I would ever try to not write about these five topics. On the other hand, I don’t like being told what to do either. This stinks. I’ve just told myself that I MUST write about these topics, and I have a tough time writing when I’m told what to write about, and now my mind has gone blank. Great. I’ve just given myself writer’s block, and I know exactly what I MUST write about. What do you think? What is worse, being told what to read or told what to write? What other topics MUST authors write about? Do you like to focus more on what you know or don’t know? What do you do when you accidentally give yourself writer’s block? I hope I didn’t cause you to have writer’s block by saying you MUST write about something. If I did, I’ll take everything back and say there is nothing that you MUST write about. I really don’t want to cause anybody to have writer’s block. Yes, “other people” is very important to writers. Or… other people are very important to writers. I wasn’t sure which response to use. I am doing all of those… except number 2… ain’t nobody got time for that… HA! Ha ha! I’m not an artist, but I’ve heard most of them don’t like to put anything emotional into their work. I don’t know if that’s true. It’s just what I’ve heard. Wait! Did you mean “number 2” as in “emotions or “number 2” as in “number 2”? Because if you meant “number 2,” that completely changes the meaning, and I’ll be very confused. I actually pride myself on using… and feeling… emotions, both as an artist and a human being. Oops. I guess I got my “number 2s” confused. Salvador Dali was very emotional in his paintings. I viewed his surrealistic art in St. Petersburg, Florida in January 2015, and could see all sorts of emotion. I think the only real rule for writing should be “Use spell-check”. Now you “MUST” make a list of five things to never write about! That was going to be my next topic, but for some reason I just blanked. I can’t think of a single topic not to write about, and I don’t know why I can’t think of anything. Haha! I love this! I am all for being free to write whatever you feel, we are all our own individuals and I think getting stuck on a set c guidelines is horrible! The whole idea of writing is to express your personal ideas and deep thoughts in your own unique way! Of we are constantly being told what to write, how are readers and writers ever going to go into a piece of writing without expecting something? Being NOT TOLD what to write is awesome because readers can go into it not knowing what they’re going to find – it’s an adventure! Reblogged this on Being me..
Reblogged this on Caroline's blog. Couldn’t agree with you more.We chose this destiny and we must fulfill it in our own way..we should not let others hinder our journey..We should have that confidence and resolve in ourselves..
Tell us more! In what way is Jean-Baptiste Grenouille an extension of his author, Patrick Süßkind? Maybe he has a strong sense of smell? Maybe he has no or little sense of smell? Maybe he knows somebody who… aw, never mind. Like I mentioned above, I have no evidence to back up what I said. I think you are right, we cannot avoid writing about ourselves. Even if we are writing a character with nothing in common with ourselves it is still our voice through them, including if they are a character whose actions we abhor, then they are a representation of our hatred. totally! we all are sailing in the same boat. I really never write about what I’m told to write about. I feel its more about discovering the world from a whole different and unique perspective which no one else can do best but you yourself. Interesting post. Best line: “… then pretend I knew it all along.” I once knew a guy that pretended he knew everything. He experienced some brain trauma and lost his short term memory. He learned that while most people will sympathize with another’s plight in some ways, even the most compassionate person will begin to think you’re stupid if you can’t remember things, and you can’t keep up. He found loopholes in our conversations that caused others to think he knew the subject matter they were discussing before they were finished. Even though I knew his plight, and I knew how he compensated for it, I couldn’t help but find his little loophole tricks annoying. It changed the way I spoke to him. It changed the way I write. I not only pretend I knew it all along now, I pretend my audience does too. It’s definitely a challenging method, and at times I may initially leave out pertinent information, but I put it back in on revision. This perspective definitely causes me to dig deeper to unearth unknown information, and different perspectives on the known information, that I think even my ‘all knowing’ friend would find illuminating. One of the things I enjoy best is when writing treats me like I’m capable of learning a thing myself, and not enough writers use that mindset. They expend a huge number of words over explaining things to the point of boredom, or trim it so far that the concepts relevant to the story (and the hooks I, as a reader, might use to learn more if I was so inclined) disappear. It’s a tightrope more people need to learn to walk. Is it bad that I was laughing through most of this post? (In the good way.) Entertaining (and truthful) read. Thanks! Laughing at this is much better than getting mad at it (or not having any reaction at all). Thank you! I love to focus more on what I know. As a startling writer, this works. Besides, you cannot captivate an audience if you sound like you’re lying. I think you made my head spin off my neck. Soooo, do we write what we know or not what we know!!! Ha ha. I think you just put down in words what makes a writer insane! I write what comes to me whether I know about it or not. Writing Happens! That is my motto and I am sticking to it. BTW…hate to be told what to do! I like that. I wish I had thought of it. That phrase might have saved me (and everybody who read what I wrote) about 900 words. Brilliant tips, thank you! I do however, disagree with point 4. You don’t always have to write about what you know. It depends on what kind of writer you are. I know people who write WAY out of their comfort zones and yet their writing is so real and captivating. Others, however, can’t do it to save their lives. It’s cringey to read and grates on one’s literary mind. ANYWAY. Maybe I am just defending this point because I always write (stories) about what I don’t know, simply because it is more interesting than what I DO know, and I desperately want it to be good! It’s always nice to hear some advice, second opinion, ideas and such. It doesn’t mean one has to follow them. I don’t believe in writer’s block but I believe in losing interest. At least for a while. Or life getting in the way sometimes. Writer’s will always be writing no matter what. Just not all the time. I don’t believe in forced creativity. It gets in the way of authentic. But Who am I to say these things. That title, with the MUST in capitals, with Hemmingway pointing a gun at me…that’s quite intimidating. I’m glad I didn’t ALL-CAP the entire title. But I guess that would have just been YELLING. I quite enjoy being told what to read; I have been introduced to many wonderful worlds through others. This post provides an interesting perspective on writing prompts and the essential elements of literature. 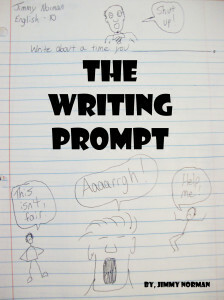 I think writing prompts challenge creativity rather than hinder it. Interpretation of a topic requirement and developing an interesting story that is in harmony with your personal writing style forces you to think deeply before you even begin writing. Our Writing shows our perception to the world…..rightly said we mention abouhe worldt “relationships”, “Emotions”, ourself, what we know and what we don’t”. It all about us. Reblogged this on The Observant Mind. This is beautiful and very useful too..! I just started my blog 2 days ago n it helps alot.. Keep.up the good work.. I constantly fight with myself about what I should or shouldn’t write and how much is too much or not enough to share. It’s very funny too. Reblogged this on K a l e i d o s c o p e.
Agreed! I stand with you on emotions and one’s self – it’s difficult for me to write anything at all unless I provide my own input; after all, it is what I’M saying so I feel like I have the right to provide my opinion on the matter! Hey, if you’re browsing my blog at work, just don’t get caught. I really appreciate your comments, but I don’t want you to get in trouble or anything.